If it weren’t for my knee…. I wouldn’t be feeling too bad today. That is for having run a marathon yesterday. I have been thinking about what could be my knee pain. I have noted that the pain seems to be a surface issue, not a pain deep within the joint. The other day it occurred to me that it was similar to ITB syndrome except it was on the inside of the knee, instead of the outside of the knee. Well, another key difference is that when you suffer from ITB, it tends to feel fine at the beginning of a run and then at some point during the run it suddenly becomes very sharp and severe. At which point, it shuts you down. My problem, by contrast tends to start tight or it becomes tight within a few hundred yards. Then it loosens up and feels okay. Yesterday, it got achy by 5 or 6 miles, but it did not get too much worse. When I paused for a walk break it did get progressively harder to start running again, but once running it functioned okay. Okay, so ITB is outside the knee, my pain is inside….. ITB symptoms come on quickly and shut you down, my symptoms ease once I am warmed up, but the area remains achy afterwards for a day or two….. So, how am I thinking that my condition could be similar? ITB results from the Iliotibial Band becoming too tight and causing friction with the outside of the knee. Since I am chronically too tight, especially in the hamstrings, perhaps there is some other band wrapping across the inner knee which is at issue. That box where it says Pes anserinus is exactly where it hurts…. Clicking around I am finding that tightness in the Semitendinosus tendon, also pictured can cause bursitis pain in the Pes anserinus. Pain over the inner, lower knee. Pain on climbing stairs is commonly reported. Pain on contracting the hamstrings (bending the knee against resistance). Pain on stretching the hamstrings. Tightness in the three associated muscles. 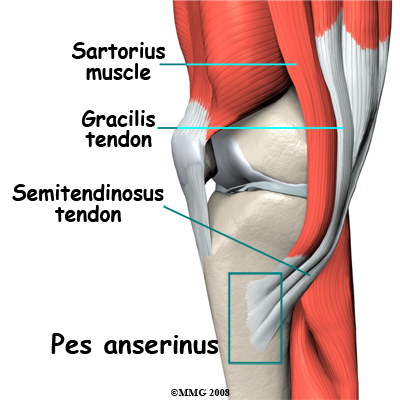 The Pes Anserine (sometimes called Pes Anserinus or the Goose’s foot) is the combined tendon of the Semitendinosus (one of the hamstring muscles), Sartorius (the strap like muscle which crosses the front of the thigh) and Gracilis (one of the long groin muscles). They attach together to the Tibia (shin bone) on the inner part of the lower knee. In this area there is also a bursa, called the anserine bursa which lies between this combined tendon and the Tibia bone underneath. This bursa may become inflamed due to repetitive friction in sports such as cycling, running and swimming (especially breaststroke). This results in bursitis. Tendinopathy (sometimes called tendonitis) can also occur at the combined tendon and the two injuries may occur in unison. When I palpated your pain at the knee the most tender spot was on the joint line about an inch and a half above where you now are saying it is most tender. I did not do a differential diagnosis of the problem but if you have increased pain in that lower spot when you dig your heel into the ground attempting to bend your knee(hamstring contraction) then yes you could have pes anserine tendonitis. It is possible the bursa is inflamed making the whole area more tender. I pinpointed your tenderness at the time of palpation to be at the joint line and it was very specific as anything below the joint line the tenderness was not significant. Probably need to reassess. Thanks for the reply Clay. As I look at the pic and try to correlate it to the real thing, my knee, I am sure that the pain is almost always and inch or two below the center of the knee (the joint line?) I am poking around right now, though and it is really hard to pinpoint an exact spot. If I press hard enough almost anywhere on the side of the knee, from the joint line down, it is a bit twingy. Tendonitis or bursitis, if that is what it is, is an over use injury, meaning too much too soon, or too much when already fatigued, or too much of a new thing. The day you started complaining of the knee pain was after that trail run in the snow. It was longer than you were used too (3+hours) on terrain that you were not used to, lifting your feet abnormally higher to clear out of the snow, and stabilizing your legs down the mountain when they were already fatigued. My guess is that it was a combination of many different stresses to the knee all at once finishing with a bunch of technical downhill running, asking the your thigh muscles to work harder to stabilize your knee when they were already tired. It is not because of tightness. Since you were favoring that knee, you altered your running stride enough to change the stress and landing patterns at your foot causing a nice big blister on the left foot. Hope that helps you determine the cause, now how about some rest to let that blister and knee heal! Thanks for the reply Karl….